Amouage was founded 25 years ago, in accordance with the wishes of His Majesty Sultan Qaboos bin Said, ruler of the Sultanate of Oman. It was his desire to create a global luxury brand with roots in Oman under which the traditional Arabian love of perfume making and gift giving could be preserved and celebrated. It was also his intention to tell the world about the ingredients particularly found in Oman, the rarest frankincense from Dhofar in the south of the country and the rarest rose of all, the rock rose harvested high up in the mountains of the Jebel Akhdar range towering over the Sultante’s beautiful capital, Muscat. 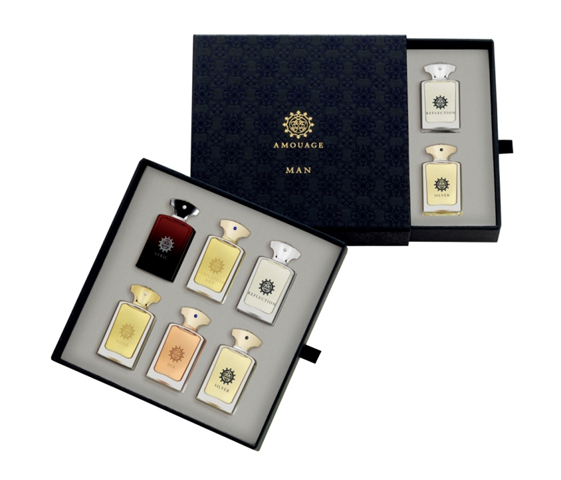 The Amouage miniature men’s collection contains six .25 oz bottles. Included in the set I have are Lyric, Jubilation, Reflection, Gold, Dia, and Silver. Each has very distinct characteristics but all are rich with great lasting power. The packing and presentation is simply beautiful. Right now, my standout favorites include Dia and Silver…but I’ve only just begun. This entry was posted in Fragrance Review, Product review and tagged Aedes de Venustas, Amouage, Amouge Dia, Amouge Gold, Amouge Jubilation, Amouge Lyric, Amouge Reflection, and Amouge Silver, Christmas Gifts, Men's Colgone, Men's Fragrances, Men's grooming, Men's Scents. Bookmark the permalink. Wow! I deal with the scents of amouage in my business, but i didn’t get the offer for this set! Its really awesome. I think the amoauge scents, are unbelievable unique. My favourite is Jubilation XXV. That looks great – I haven’t seen it before. (All apart from the price tag). What a great gift idea.